Online programs in Ohio offer the flexibility to continue working while learning. Some schools, such as Ohio State University, offer completely online programs, even in health occupations, while others offer a hybrid mix of online and in-person learning. Even if you’re not sure if earning an online degree is the right choice for you, this page walks you through some of the important questions online students in Ohio should get the answers to before making a college decision, including which colleges and universities offer the best online education in the state. Every online student has different priorities when it comes to finding the right school—a working mom might need to find a program that offers a variety of evening and weekend classes to accommodate her schedule, while a nursing student may want to find an accelerated program to get into the workforce and earn a paycheck as quickly as possible. But beyond flexibility and accessibility, there are quality measures online students should take into account when choosing which college to attend. 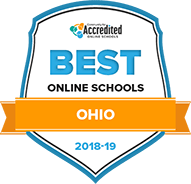 We help make the search easier by providing a list of the best online colleges in Ohio who offer a combination of top-quality education standards and student support. Best known by many for their athletic programs, Ohio State University is also home to some of the top academic programs in the nation. Academically, their health and science departments get the most attention, often considered to be among the best in the nation. Students that don't want to study in a traditional manner can still study toward health and sciences through their online school. Ohio State Online currently offers 3 undergraduate programs: a bachelor's in dental hygiene, health science and nursing. These programs are technically degree completion, so students will need to have previous credit before applying, making these programs ideal for transfer students. To help keep costs low, any students that do enroll 100 percent in distance education will be given Ohio resident tuition. Students looking to get this tuition will need to be sure that the program they're starting is entirely online, or that they already qualify for in-state tuition. Mount Vernon Nazarene University is one of the top private, Christian schools in Ohio. While many of the students choose degrees related to ministry, MVNU also offers a wide variety of degrees popular at other institutions. There are 5 online undergraduate degrees offered by Mount Vernon, and their bachelor's of business administration can be further focused in 1 of 4 categories. After, students can pick from 1 of their master's degree programs, some of which can be fast-tracked or dual majored. MVNU designed the majority of their online degree programs with adult learners and full-time workers in mind. Even with a busy schedule, MVNU estimates that students should be able to complete some programs in as little as 15-21 months, and potentially even less if they have already completed some of the required foundational courses. The costs for their online school vary depending on the specific program. Not only does Ohio University have a large on-campus student body, but they also have one of the largest e-learning student bodies in the nation. There are currently over 8,000 students studying through Ohio's undergraduate and graduate programs online, and that number is steadily increasing. So many students enroll in the online school because of its quality - all 10 of their undergraduate degree programs are held to the same standards as their on-campus counterparts. While out-of-state students will be required to pay more than in-state students, they will not see their tuition or fees increase in the first 12 consecutive semesters of study. Since their online degrees are designed to be completed in 8 semesters or less, most online students shouldn't see an increase in what they pay while they attend Ohio. With over 44,000 students and roughly 250,000 alumni, the University of Cincinnati can give future graduates a network to find the right job, particularly in the busy Cincinnati area. Because not all students are able to commute to campus, UC offers 15 entirely online bachelor's degree programs. It's worth noting that 5 of these programs are degree completion, meaning students will need transfer credit or prior school credit - but these degrees can be earned in less than 4 years. With affordability being an important factor for many incoming college students, the University of Cincinnati has created a structured tuition cost for each individual program through their online school. Students will need to check their desired program to find out how much the tuition will be. Regardless of the cost, Cincinnati also offers financial aid, and the majority of their online students receive some form of financial aid. Founded on the Jesuit method, Xavier University has found success in placing students after graduation, boasting that 98% of their student body is employed or furthering their education after earning a degree. Xavier has found the same success with their online program as 98% of those graduates end up in the same position. A big reason their online program is so effective is their network of mentors. Every online student has access to a professional mentor, many of which have their own professional network to help connect graduates with opportunities. It's worth noting that the online school at Xavier currently does not offer any undergraduate programs - however, all 8 of their master's degree programs are considered among the best in the state. Students that are earning a bachelor's degree soon and want to continue their education will want to see what Xavier has to offer. Located in northwest Ohio, Bowling Green State University is home to over 19,000 students. Their success is largely due to their effort to maximize the first year of all their programs, giving students more exposure to their field early on. This method extends to their online campus where students can complete one of four entirely online bachelor's degrees, each designed to give students early exposure to their field. The majority of the courses offered in their online programs last 7 weeks, helping students get more flexibility with their online studies while still pacing themselves to graduate in 4 years. Along with these entirely online courses, there is also one blended program - a bachelor's in liberal arts - that is 50% online and 50% on campus. Courses through this program last the traditional 16 weeks. The time it takes to complete any of these programs can be reduced with transfer credit. One of the largest and top funded schools in Ohio, the University of Toledo is constantly looking for ways to improve education for their students. With the growth of distance education, Toledo has made their presence in online education known. They currently offer 25 different undergraduate programs through the online school, all of which can be completed entirely online. This is one of the largest assortments of entirely online undergraduate programs offered by a single institution. Students are also able to take some of the courses on-campus and may be required to spend time earning in-person experience if they are looking to get certification. Transfer students looking for a place to complete their undergraduate education can benefit from Toledo's transfer and adult student scholarships and awards. To be eligible, transfer students must have already completed 12 or more credit hours at an accredited institution. Although the school has been around since 1845, Baldwin Wallace University has been going through a lot of change recently. Along with expanding the number of academic programs offered and introducing new ways for students to study, Baldwin Wallace officially changed from a college to a university just 6 years ago. The name change was meant to reflect the growth of the school, both in terms of size and prestige. The online programs offered through BW are a reflection of this growth as they're constantly adding more online options while maintaining their high standards for education. There are currently 4 programs offered entirely online through BW as well as one hybrid program. The cost of earning an education can be easily reduced with the vast majority of Baldwin Wallace University students receiving financial aid. Of those, 96% of transfer students earned some form of aid in 2017-2018. Over the past 140 years, Ashland University has grown from a small college to a university that offers education at all levels. Along with the growth of their campus, student body and educational options, Ashland has extended into the digital space with their online school. Students studying toward an online degree at Ashland can choose from 5 bachelor's degree, 3 associate degree and 4 master's degree programs. All of their online degree programs can be completed entirely online or through a hybrid of on-campus and online courses. One unique aspect of their online undergraduate nursing program is that it can also be completed in an accelerated format. Through the accelerated format, nursing students will complete 64 credit hours over the span of just 15 months. Along with their courses, students will be required to gain clinical experience to become a certified nurse. This program is designed for students that have already earned a bachelor's degree in another field. Founded with Christian faith in mind, the University of Findlay has garnered a reputation for having some of the top health and science programs in the region. While many students choose to pursue their education traditionally, Findlay makes it easy for online students to earn their degree as well. Their main online undergraduate degree program is their degree completion, meant for transfer students with at least 61 credits. Students in this program can choose to complete their degree in 1 of 4 fields: business management, emergency operations, health care management and environmental safety and health. Along with their undergraduate degree completion, Findlay online offers different degrees at every level, as well as some licensing and certification. All of these programs can be completed online, unless clinical hours are required. Every online student also gains access to Findlay's extensive online library to help with their studies. Findlay also offers online tutoring, tech support and access to their experience faculty and staff. Walsh University offers online accelerated bachelor's degree programs for professional adults. Students can pursue a Bachelor of Arts in Communication, Digital Media, Corporate Communication or Organizational Development and Leadership. Those who hope to work in a business-related industry can enroll in the Bachelor of Business Administration and concentrate in accounting, management or marketing. They can also build their own bachelor's degree by concentrating in up to 3 areas. Available concentrations include accounting, corporate communication, digital media, leadership, management and marketing. Applicants to the accelerated online bachelor's programs must be at least 21 years old and have a GPA of 2.0 in their prior studies. Applicants are expected to transfer at least 12 credits from a previous school, but they can test out of certain credit requirements. All online courses at Walsh University are taught by the same experienced and skilled faculty members who teach on campus. The online courses are offered through Electronic Course Network, which allows students to access course information, discussions, blogs and tests all in 1 area. In addition, online courses are offered in an asynchronous format so that students can learn anywhere at any time. Cleveland State University offers 3 online bachelor's degree programs: a Bachelor of Science in Nursing (BSN), a Bachelor of Business Administration or a Bachelor of Arts in Organizational Leadership. The BSN program is designed for students who are licensed registered nurses in Ohio and hope to advance their careers. It can be completed in 1 year over 3 continuous semesters. Students who have completed an associate degree at a community college and wish to earn a bachelor's degree can enroll in the Bachelor of Business Administration or Bachelor of Arts in Organizational Leadership programs. They are required to have completed a minimum of 60 semester hours and earned a GPA of at least 2.0. All of the courses in Cleveland State University's online degree programs are designed to meet Quality Matters standards. Quality Matters is a review process that certifies the quality of online courses. Kent State University gives students the opportunity to earn a bachelor's degree online. Students may choose from a Bachelor of Science in Nursing, Information Technology, Insurance Studies, Public Health and Respiratory Care. Several of these online bachelor's degrees allow students to concentrate in a topic that interests them. For example, students enrolled in the Bachelor of Science in Information Technology may concentrate in application development, applied computer security and forensics, health information technology, integrated information technology, multimedia or networking. First-time freshmen can apply to any of these programs by submitting their official high school transcripts and ACT or SAT test scores. Transfer students who have taken 12 or more semester credit hours are required to hold a minimum GPA of 2.0 and submit transcripts from every college or university they've attended. There are a variety of bachelor's degree programs available at Muskingum University. Students can earn a 4-year degree in accounting, business management, child and family studies, communication, criminal justice, early childhood education, human resource management, information systems, special education or marketing. Those who already hold associate degrees may pursue a health care bachelor's degree in a range of areas such as community health and wellness, health science and fitness science. Students may enroll on a part-time or full-time basis and complete their degree in as little as 1 year. All online bachelor's degrees at Muskingum University are accredited by the Higher Learning Commission of the North Central Association of Colleges and Schools. To graduate, students must complete a minimum of 124 credit hours and earn a cumulative GPA of at least 2.0. Transfer students are required to complete at least 32 credit hours at Muskingum University in order to graduate with an online bachelor's degree. University of Dayton offers an online bachelor's degree in Early Childhood Leadership and Advocacy. This part-time program is created for early childhood professionals such as administrators, supervisors and teacher leaders who hold an associate degree in early childhood education or a similar field. To complete this 121-credit-hour degree, students must earn at least 54 credit hours from a 4-year institution, 30 of which must be completed at the University of Dayton. After graduating with a bachelor's degree in Early Childhood Leadership and Advocacy from University of Dayton, students will have the skills and knowledge to teach grades Pre-K through 3rd, although the degree doesn't include licensure. Early childhood professionals who are interested in this degree are encouraged to take an online course to test out its quality and familiarize themselves with the Bombeck Institute, which offers professional development and other services for those who work with young children and families. At Youngstown State University, students can pursue a bachelor's degree in general studies, applied science, criminal justice, public health, nursing or respiratory care. The general studies, allied health, criminal justice, nursing and respiratory care programs are for students who have already completed their associate degrees. The public health program is not a completion degree. It requires completion of 127 credit hours and typically takes about 8 semesters to complete. Students who enroll in the public health degree often go on to become Certified Health Education Specialists or they complete the sanitarian exam and become health inspectors. Prospective students who hope to attend college for the first time are required to submit their official high school transcript and ACT or SAT test scores. Those who are transferring from another college must also provide their official high school transcript and proof that they passed the Ohio Graduation Test if they are from Ohio. Students may complete these degree programs 100% online or in a hybrid format where they take a combination of online and in-person courses. At The University of Akron, registered nurses may pursue an online Bachelor of Science in Nursing that is accredited by the Higher Learning Commission and the Commission on Collegiate Nursing Education. This degree is available to those who have a valid license as a registered nurse, have been admitted to the undergrad nursing program, hold a minimum GPA of 2.75 and have earned grades of a C or higher in all prerequisite science courses. This 32-credit-hour program includes core courses such as Concepts of Professional Nursing, Nursing Research and Nursing Care of Communities. Students may complete this degree in one year while taking classes full time or 2 years if they decide to enroll on a part-time basis. Due to the low student-to-faculty ratio, BSN students will receive individualized attention. They will also work with a School of Nursing adviser to design a plan of study that is right for them. God's Bible School and College offers three different online bachelor's degrees that are accredited by the Association for Biblical Higher Education and the Higher Learning Commission. Students may major in biblical and theological studies, ministerial education or church and family ministry. The biblical and theological studies program focuses on personal evangelism and biblical doctrine and its graduates have gone to become missionaries, bible teachers and PhD candidates. Students who pursue the ministerial education degree may specialize in pastoral counseling, youth ministry, pastoral ministry, urban ministry, Christian leadership, world missions, music ministry or Christian education. The church and family ministry degree is intended to prepare students to work as children's ministry workers, Christian school teachers or similar positions in a church environment. All online bachelor's degrees at God's Bible School and College are 120 credits and typically take 4 years to finish. To apply, prospective students should complete an application and submit a recommendation form that is filled out by their pastor, teacher or employer. Malone University offers 4 online bachelor's degrees that can be completed in 124 credit hours. These degrees include a Bachelor of Arts in Social Work, Bachelor of Arts in Organizational Management, a Bachelor of Arts in Business Administration and a Bachelor of Science in Nursing. The social work program prepares students to pass the Licensed Social Worker certification. Students who pursue the 4-year organizational management degree can gain the knowledge and skills they to work as human resource managers, financial controllers, operations managers and business communications professionals. The business administration program focuses on topics like marketing, management and strategy while giving students the chance to double major. Working nurses who would like to complete their bachelor's degree in as little as 14 months are good candidates for the nursing program. Students who opt for an online bachelor's degree at Malone University may complete their programs on a part-time or full-time basis. Although admission requirements vary by program, most online bachelor's degrees require official transcripts and letters of recommendation. Ohio Dominican University allows students to pursue bachelor's degrees online. Students may major in business administration and choose a concentration in marketing and management. They may also earn a four-year degree in risk management and insurance and prepare themselves for careers as risk managers, compliance officers, claims managers or actuaries. Additionally, Ohio Dominican University offers a bachelor's in cross-disciplinary studies. This program was designed for adult, transfer and continuing education students who have a significant amount of credits and hope to complete a curriculum that matches their particular strengths and interests. First-year freshmen can apply for an online bachelor's degree program by submitting their official high school transcripts and ACT or SAT scores. Transfer students are encouraged to reach out to an admission counselor who can guide them through the application process. They can transfer up to 68 credits from college-level courses in which they earned a C or higher as long as they are from a regionally accredited college or university. Wright State University offers one online bachelor's degree for students who wish to earn their Bachelor of Science in Nursing. This program is designed for working nurses who are in search of a flexible way to complete their 4-year degree. Students who would like to enroll in the online Bachelor of Science in Nursing are required to hold an active Registered Nurse license as well as a cumulative GPA of 2.0 upon entry. Applicants must have completed English Composition I, English Composition II and Introductory Psychology coursework with at least a C and must have a clean criminal background. The online BSN coursework entails 120 credit hours of core courses, electives and nursing classes. Nurses who work at Premier Health and decide to pursue this degree may apply for Premier Health enhanced tuition assistance. This scholarship program helps Premier Health nurses who are completing a nursing degree at Wright State or taking required prerequisite courses with out-of-pocket expenses. An academic adviser at the College of Nursing and Health is dedicated to assisting online BSN students with applying, selecting courses and meeting graduation requirements. Union Institute & University offers online bachelor's degrees in business, education and social sciences. Students who would like to pursue a bachelor's in business can choose from business management or organizational leadership. Those interested in education may opt for a 4-year degree in child and adolescent development, early childhood studies, elementary education, exceptional student education or secondary education. Available online social sciences degrees at the bachelor's level include social work, criminal justice management, emergency services management and psychology. Union Institute & University also offers the only online bachelor's degree in human lactation in the country. Most online bachelor's degrees take 120 semester hours to complete and accept up to 90 semester hours in transfer credits. Various concentrations are are available in programs such as business management and emergency services management. All online students enrolled in a bachelor's degree program can take advantage of Union Institute & University's career resources that assist with internship placement, networking, resume writing and more. They are also encouraged to apply for undergraduate scholarships. At Notre Dame College, students may earn online bachelor's degrees in business, criminal justice, education, nursing and psychology. Students who choose a business degree will learn how to analyze and interpret information to make informed business decisions. Those who opt for criminal justice will study the US criminal justice system and prepare themselves for careers in a number of fields including law enforcement, victim advocacy or the courts. Students who enroll in the education program will be qualified to pursue licensure and teach at various grade levels. Nursing students will gain the knowledge and skills to practice nursing in a variety of health care environments and those in the psychology program will deepen their knowledge of human behavior. Notre Dame College's admissions office makes it easy for online students to apply for the bachelor's degree of their choice, register for classes and work with an adviser. Students can apply by submitting their official high school transcripts and ACT or SAT scores. Although transfer students are welcome to enroll in an online bachelor's degree and transfer academic credits earned within the past 5 years, they are required to complete at least 32 credits at Notre Dame College. How Can I Find Which Online Colleges Offer the Degree I’m Looking for in Ohio? The most accurate way to explore the programs each college offers is to check the school’s listing of online programs. Students can also use the Ohio Department of Higher Education’s OhioLearns database to search for online degrees, programs, and courses available in Ohio. Which Online Schools in Ohio Will Accept My Transfer Credits or Work/Life Experience? Whether returning to college, transferring schools, or entering college for the first time, prospective students in Ohio should check if their prior learning experience will gain them any credits toward their degree. Students with credits from other accredited colleges can likely transfer some credits to their new program, but each school has its own transfer policy. Students can use Transferology to get an idea of how their credits may be transferred and applied. Many colleges and universities in Ohio award academic credit for prior learning. Students can earn credit by exam or through CLEP testing at schools such as Cleveland State University, Kent State University, and University of Cincinnati. Other Ohio colleges, like Bowling Green State University, Ohio University, University of Northwestern Ohio, and University of Toledo permit students to create portfolios demonstrating their prior learning experience. These portfolios are reviewed by faculty to determine whether the student has knowledge and experience equivalent to the courses in question. How Much More Do College Grads in Ohio Make? Like most other states, Ohio’s job market supports the belief that a college education helps you make more money. The U.S. Bureau of Labor Statistics provides salaray data and mibimum degree requirements for occupations around the nation, and in Ohio, jobs that require higher levels of education also pay more, on average. Earning a bachelor’s degree in Ohio could mean a significant pay increase; on average, careers that require a bachelor’s level education pay nearly 60 percent more than positions that require no formal education, and 40 percent more than jobs that require a high school diploma. But the most significant jump is for doctoral degree holders, whose jobs pay, on average, $40,000 more per year than those that require a master’s degree. As of August 2018, the Bureau of Labor Statistics also reported that Ohio had an average unemployment rate of 4.5 percent, which is higher than the national average of 3.9 percent. Students may be able to combat unemployment by earning a college degree. Accreditation establishes a quality threshold for colleges and universities, and it signals to prospective employers and schools that you received your education from a reputable source. Accreditation is important for all students, but online students should pay special attention to a school’s accreditation status to ensure the value of their degree. Regional Accreditation: Quality colleges and universities in Ohio are accredited by the regional accreditation agency, the Higher Learning Commission (HLC). The online programs highlighted in this guide are all accredited by this agency. Specialized Accreditation: In addition to HLC accreditation, many colleges carry subject-specific, also known as programmatic, accreditation. For example, Cleveland State University’s nationally-recognized Monte Ahuja College of Business is accredited by the Association to Advance Collegiate Schools of Business. While tuition costs continue to rise, the Ohio Undergraduate Tuition Guarantee Program mitigates these increases for students. According to this 2013 policy, public colleges may increase tuition costs only if they freeze the new tuition cost for at least four years. Take a look at the following answers to frequently asked questions to learn more about how to navigate paying for college in Ohio. What are Ohio’s requirements to qualify for in-state university tuition? To gain residency status, most students must have lived in the state for at least 12 months prior to enrollment, and they must have given up their residency status in their home state. The University of Toledo offers a Residency Predictor that applicants can use to determine whether they qualify for in-state tuition. University of Cincinnati offers special tuition rates for qualifying students from Kentucky and Indiana as part of a tuition reciprocity program. Are Online Credits More Affordable in Ohio Than Other Places? According to a recent study by the College Board, Ohio’s average tuition costs for public four-year programs are more expensive than 31 of the 52 U.S. states and territories profiled. This means that Ohio’s average tuition is slightly higher than the national average. Online tuition costs in Ohio range from $240 per credit (Ohio University) to $545 per credit (Union Institute & University). So how does this stack up against other online colleges and universities nearby? Though rates may vary, it’s important to keep in mind these do not include additional fees. Be sure you understand all the incidental charges a college will add on top of this per-credit rate to get the full picture of your total online education cost. How Can I Get Help Paying for Online College in Ohio? The first step to funding an education in Ohio is to submit a Free Application for Federal student Aid (FAFSA). While the federal government has a deadline of June 2019, Ohio colleges and universities request students submit the FAFSA by October 2018 to obtain state financial aid. Even if a student does not qualify for federal aid, they may still qualify for state aid. American Legion Auxiliary of Ohio Scholarships: This veteran organization offers scholarship opportunities to veterans and their relatives, including some that are specifically for nontraditional students. Cleveland Foundation Scholarship Directory: This community foundation offers a directory of over 60 scholarships, including some for graduates of select Ohio high schools. Forever Buckeye: This program guarantees Ohio high school graduates in-state tuition at Ohio colleges and universities, even if they moved out of the state at some point before enrolling. Foundation for Appalachian Ohio Scholarships: This community organization hosts over 50 scholarships for students in Ohio and offers a directory of additional scholarships. Marietta Community Foundation: This community foundation administers over 50 scholarships, many of which are nomination-based and do not require students to submit a formal application. Ohio College Opportunity Grant: This need-based grant helps students pay their tuition costs using information from the FAFSA. Award amount varies by location and type of enrollment. Ohio National Guard Scholarship Program: Ohio Army National Guard and Ohio Air National Guard members are eligible for this program, which may pay up to 100% of their tuition costs. Ohio News Media Association Scholarships: These four scholarship award funds of $1,500 to $2,000 and are available to students pursuing a degree related to journalism or media. Ohio Safety Officers College Memorial Fund: The children and/or spouses of Ohio safety officers who died in the line of duty are eligible for this scholarship, as are the spouses and children of some fallen soldiers. Ohio War Orphans Scholarship: Children of fallen soldiers or severely injured veterans are eligible for this scholarship, which may pay up to 84 percent of their tuition at a public college or over $6,000 of their tuition at a private college. Adult education primarily serves individuals who want to develop new skills to advance their career, and often times, enter college. Adult and continuing education programs are often offered through career or community centers, but some colleges and universities in Ohio also offer these programs, such as the University of Toledo’s College of Adult Lifelong Learning. Some other useful adult education programs and resources include Ohio.gov’s adult education & training directory, Ohio Department of Higher Education’s workforce training and adult education guide, and Ohio’s Aspire campuses and programs.